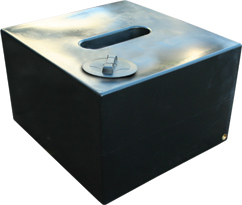 This is our 500 litre water tank, it has a slim design which makes it great for small places. All of our water tanks are manufactured from a strong, durable plastic called polyethylene that is weather resistant and frost resistant. To make using our slimline water tank even easier, we pre-mould a 1" BSP outlet in to the base of the tank which you can attach a brass garden tap. To give you easy access inside of the water tank we cut and attach an 8" screw down vented lid. This can be used to install a submersible water pump or suction pipe.